He might be 34-years-old but that isn’t stopping half German left-back from enjoying the best football of his career at Watford. The Hornets managed to overcome the obstacle of the Wolverhampton Wanderers last Sunday at the Wembley Stadium for the FA Cup semi-finals. 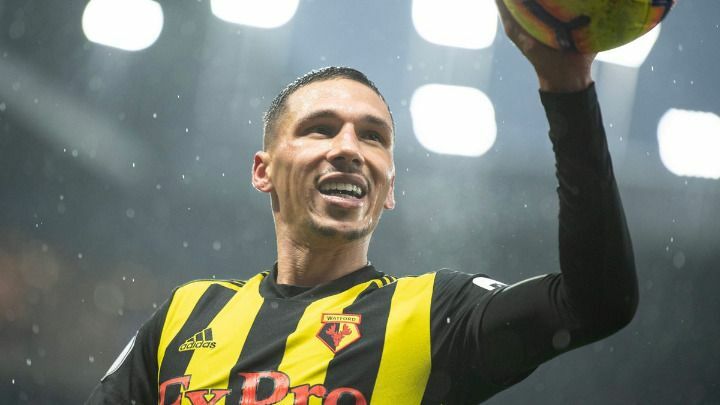 With Holebas in their starting line-up, Watford managed to turn the tables on their opponents who were leading by two on the 62nd minute of the match, sending the game to extra time where they found a crucial third goal that sent them to the final. Now Holebas and his teammates will need to overcome the obstacle that answers to the name Manchester City if they are to lift the highly coveted FA Cup trophy, on the final that is set to take place on 18 May at the same venue. The former Olympiacos defender’s contribution towards his team’s success has been significant this season, since he has recorded 25 appearances, 3 goals and 6 assists in the Premier League, even though he still maintains his disciplinary issues, topping the table of players with most yellow cards with 11. The 32-year-old MMAer is quickly earning his reputation, as he maintains an unbeaten run of six fights. His most recent “victim” was Russian Amirkhan Isagadzhiev, who lasted two rounds with him in the ring before the official stepped in to call off the fight and declare “Arzoo” the winner. It would be just as easy to place Apostolos in the “Sinners” section for his thoughtless action to tackle Mandi from behind that led to his two game dismissal (and possibly the early end to his season), yet considering his young age (19), this will be a valuable lesson for the Adelaide United forward. Hot off his heels from his recent appearances in the NPL, Stamatelopoulos appeared as a constant threat in front of the Phoenix goal last Saturday and managed to put two passed his soon-to-be teammate at Western United, Filip Kurto. The young Greek forward continues to show signs of growth in his play and should he continue like this in the next season, it’s likely he could be considered for the national teams. A former player of Olympiacos and AEK, the 40-year-old was recently caught in the middle of a scandal involving fake products. During a police check inside his car, it was found that he was transferring numerous fake products, such as sun glasses, handbags and shoes, which he was intending to sell on the black market. This resulted in the arrest of the former defender, who is now awaiting his trial. Last Saturday was the “big blue” derby between Sydney FC and Melbourne Victory, arguably one of the greatest football rivalries in the country. This game could possibly garner interest even from outside Australia, with the participation of several important players such as le Fondre, De Jong, Reza, Caceres, Toivonen, Honda and Niedermeier. So with this small window of opportunity to show off the sport to other nations, one would think that the organisers would have made sure that everything would be in perfect condition. But no. The two teams came out to play on a pitch reminiscent of a school playground that resulted in the (thankfully not serious) injury of Victory play maker Terry Antonis. This forced even Ola Toivonen (among others) to question the methods the FFA have of checking the quality of football stadiums. This situation begs the question: is this really the image we want to be putting forward to the rest of the world..? It has already been said through this column that organised fan clubs in Greece have turned stadiums into battle areas that are unwelcoming towards simple spectators or friends of sports. The latest incident proving this fact was at the PAOK-Iraklis volleyball game, where the “fans” of PAOK racially attacked Iraklis player Byron Ferguson. The 29-year-old from the Bahamas began a verbal argument with the home side supporters during the first set of his team’s 3-0 loss, that eventually led to them slandering him. Following this incident, the officials from Iraklis have filed a complaint toward the World Volleyball Federation (FIVB), asking for the PAOK team to be penalised for their fans’ behaviour. Yet it seems this is just a drop in the ocean of extremism surrounding Greek sporting events.